I love piping so much even though I do not show this much in my work. 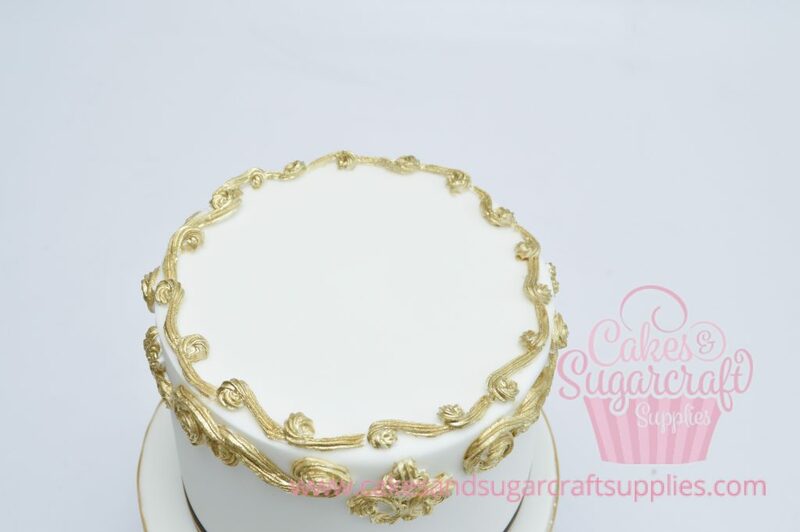 Some modern cake decorators feel royal icing piping is out of fashion especially with the rise of silicone molds. These silicone molds can be so fiddly and work better with gum paste which can be very expensive. On the other hand royal icing is cheap and very easy to make. 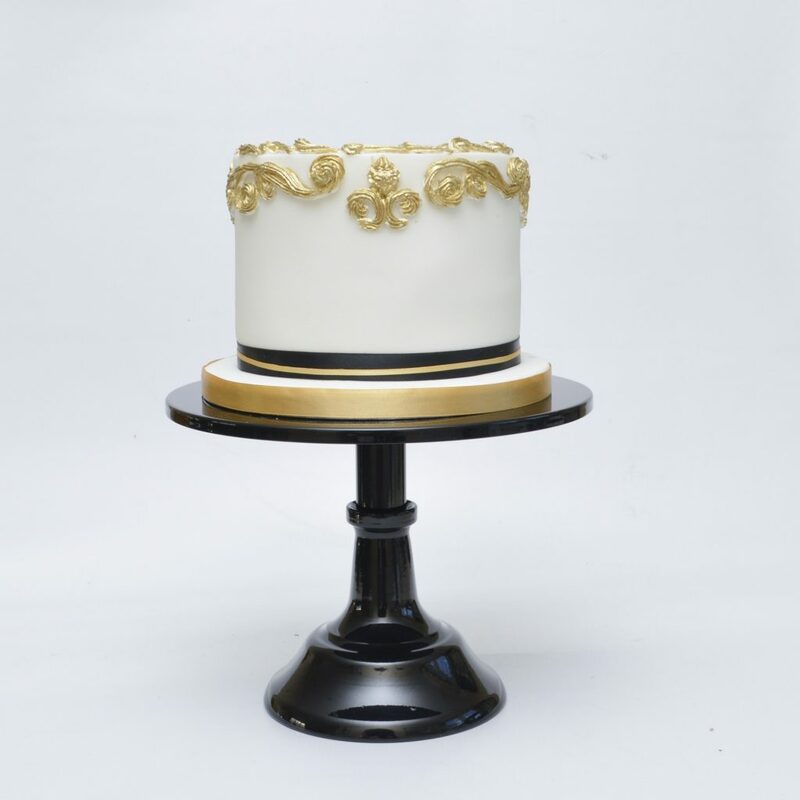 With royal icing, you can adjust size and look of the design by using different nozzles. 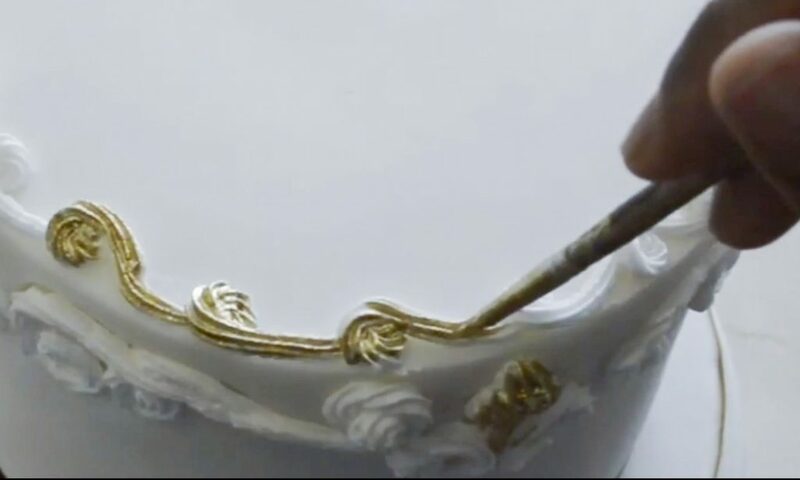 In this tutorial, I will show you how to pipe a scroll design with royal icing and paint the design with edible gold paint. Wilton scroll leaf design embossers from Wilton 28-Piece Decorative Press Set you can purchase it through this link. A batch of firm peak royal icing. Visit Meadow Brown Bakery website for the tutorial or how to make royal icing video tutorial. Here is a quick recipe below. Thank you so much Esther for doing this royal icing recipe video tutorial for me. Make sure your bowl and whisk is clean and free from any grease or else your egg whites will not firm up when you whip. Beat for 15 mins or until your royal icing reach firm peaks and its thick. 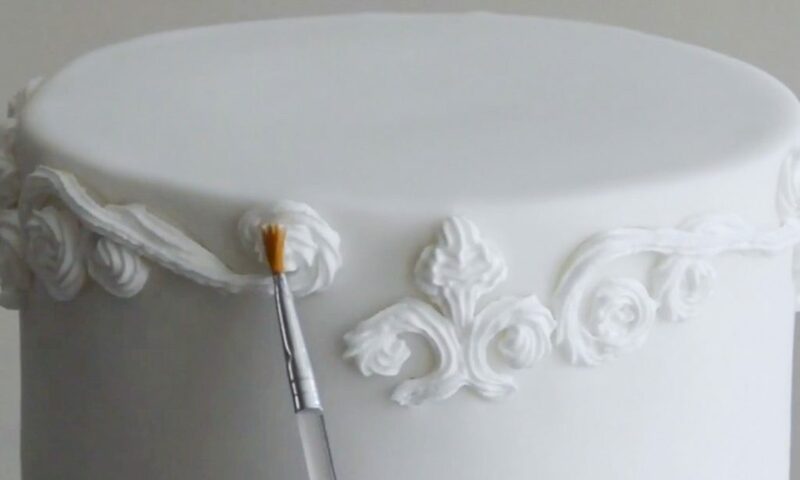 For best results embossing need to be done on the cake that has just been covered with sugarpaste. This need to be done while the sugarpaste is still soft. 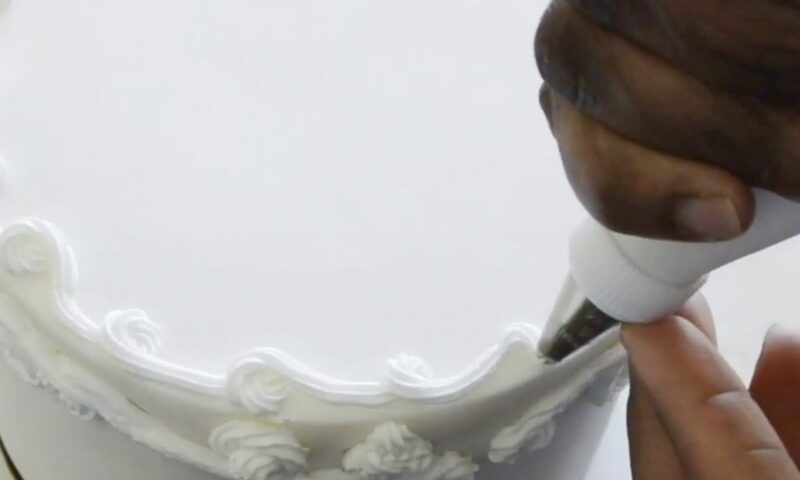 This same technique can also be done on ganache cakes, buttercream cakes or cupcakes. Attach your piping noozle to your piping bag and add your royal icing . Sorry I did not record that part in the video tutorial, will do next time. Start piping as seen in video tutorial. Use a damp paint brush to dab down any picks at the end of your piped design. Mix 10ml of clear alcohol with 1/8 teaspoon of rolken super gold dust to form a paint. This need to be in liquid form and not too thick, add more alcohol if its too runny. Royal icing dry and hardens very quickly so you can start painting. I hope this has motivated you to stop molding and start piping again. 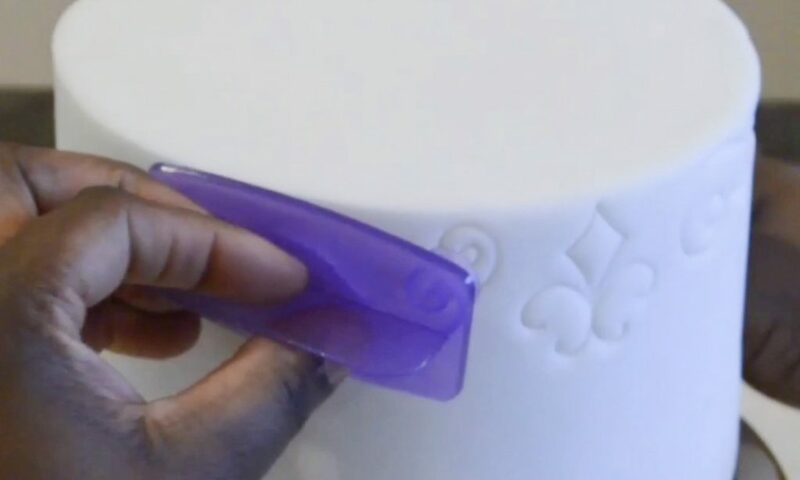 Posted in Articles, Recipes, Video and tagged Busi christian-iwuagwu, Cake, cake decorating tutorial, Piping, piping bag, rolkem, royal icing, royal icing recipe, Tutorial, wilton, Wilton 28-Piece Decorative Press Set, Youtube. This is a nice concept.Will give it a trial. Hi, I came across your site. I love watching all your work. I would like to learn more about cake decorating.! I honestly enjoy this site very much. Very talented! I look forward to all your postings. Wish I can take classes or courses with you. Sincerely Evonne Rosado. Have a great day!